Being a group of six scientists we'll head off to Kangerlussuaq, western Greenland, on April 19. Our team aims at recording and studying the traces that the recent warm summers left on the surface of the Greenland ice sheet. One year ago we found indicators of changes due to increasing summer-melt at one particular location; this year we are going back to perform more detailed measurements over a much larger area. 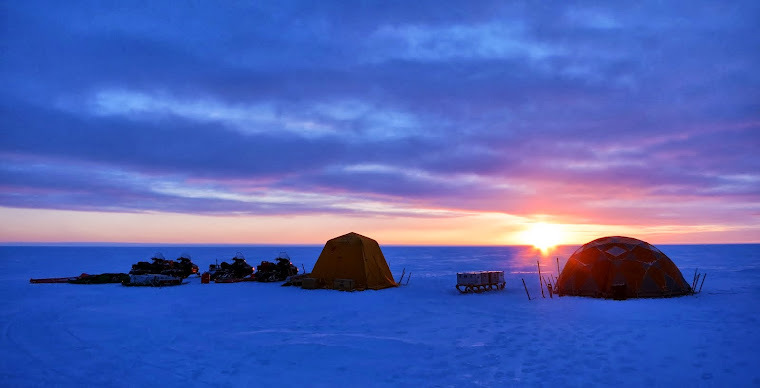 We will be working on the ice sheet for one month in varying teams: From April 23 to May 7 Mike, Mark, Dirk, Babis, Liam and Horst will perform the investigations while a smaller team of four (Mike, Karen, Alex and Horst) will continue working on the ice during the second period from May 7 to May 23. Our work will take place in the middle of the ice sheet between 50 to almost 300 km away from its margins. We will travel larger distances using Skidoos and en route we will stop frequently to drill so called firn cores. Measuring various parameters in these cores of about 15 m length will tell us how the near surface layers of the ice sheet have changed under the impact of the recent sequence of very warm summers. Apart from drilling numerous firn cores we will use other techniques such as ground penetrating radar to look down into the snow and learn about its structure and the traces summer melt left behind. Finally we will use the opportunity of being there and maintain a set of existing installations on the ice, including a total of four weather stations and various other measuring devices. "We will travel larger distances using Skidoos"
Please tell everyone you are joking about using evil CO2 spewing, fossil fuel powered vehicles. Very, very bad, makes you look like global warming hypocrites.